randymajors.com: Are you sure you're looking in the right county for those records? 1. Go to the Historical County Boundary Maps interactive tool. 2. Type in a PRESENT-day place in the Place box. For example, type Los Alamos, NM. You can even type a present day address, county, or road name too, such as Canyon Rd, Los Alamos, NM. Remember, even if you know the county name or place name used to be something different, you must type the PRESENT-day address, county, road or place, not the historical name. 3. Tab over to the Year box, type the year you believe your ancestors settled in the area, then click the Go! button or press the Enter key. To be safe, even if you know your ancestors settled the area in the 1880s, you might want to type 1870 in the box. 4. To quickly see if you need to be concerned about shifting boundaries for this location, here's a shortcut: click the arrow key on the right side of the Year box to scroll forward a decade at a time (you can also click the arrow key on the left side of the Year box to scroll backward a decade at a time). 5. For any given year where you see a shift, just click the map at the location you're searching to see a box pop up with the name of the county and a little history on the nature of the most-recent boundary change as of that year. The above method will quickly help you see which other counties you might need to look in for the records you seek. 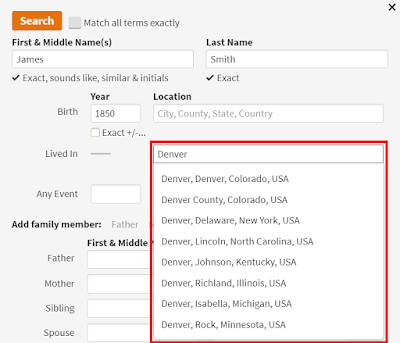 If you're searching on some online services such as Ancestry.com, now you know which other county names to type into the search box. If you're looking for records that may be held at the local county courthouse, archives, or genealogical society, now you know which counties you need call on to see if they know which repository holds the records for the timeframe in question. Also, the same approach outlined above works on the Historical World Boundary Maps interactive tool to see country boundary changes over time. Finally, here's a bonus for those who read this entire post! If you want to make your map larger, I have added a small + button in the upper right corner of the map window that enlarges the map.